Believe it or not, PETA would give this a big "paws-up." 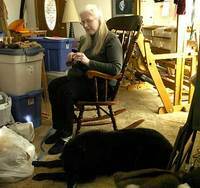 Betty Burian Kirk (above, with her dog, Rex) of Lemont, Illinois will knit you a hat or scarf from the hair of your dog. Send her between $50 and $200 along with a grocery bag full of your dog's hair and you'll get back a wearable version of your beloved companion. Jennifer Skalka wrote about this new version of pet intimacy in a February 16 Chicago Tribune story, which follows. Devoted dog owners will do almost anything for their favorite pooch. They let them sleep in their beds on expensive linens. They give them filet mignon and short ribs. They pucker up for wet, silly smooches on the lips. But would they want to wear Rocky or Stella? One Lemont woman is betting they do. Betty Burian Kirk knits with dog fur. Bring her your golden retriever's hairballs, and she'll spin you a scarf or a hat. Kirk, whose work is featured through March in an exhibit in Lemont Public Library titled "Putting on the Dog," is a former elementary school art teacher turned spinner. She works with traditional materials, such as felt and wool, but also has created a process for turning dog hair into skeins of yarn, which can be woven into accessories. "Like anything else, it's finding your market," said Kirk, 51. "I thought this would be perfect because people love their dogs." With her Belgian sheepdog, Rex, panting heavily at her feet and a ball of yarn made from Rex's hair in her lap, Kirk explained that she is attracted to dog hair because it is sentimental and produces novelty items that people won't find at the mall. "My youngest wants me to make a Rex hat for him," said Kirk, who has two teenage boys and is married to a systems engineer. As she spoke, several scarves and hats born of man's best friend sat by her side. They were fuzzy, slightly coarse and in a range of earthy colors, such as taupe, gold and chocolate brown. Kirk instructs dog owners interested in immortalizing the family pet to collect a grocery bag full of its hair. The most sumptuous hair, she said, is from a dog's underbelly. Because no one wants to smell like their dog, Kirk's first move is to wash the hair with dish soap and vinegar. Once it dries, she cards it to straighten out the fibers. Then Kirk, who grew up in Cicero and is a graduate of Morton East High School and Northern Illinois University, spins it into yarn, which eventually becomes the skein. Kirk's creations cost $50 to $200. Not every breed's coat provides a luscious finish. Fluffy Samoyeds, huskies and chows are great. Pointers and Labrador retrievers, which have shorter hair, are not. Though Kirk has found her passion, she concedes it's not everyone's bag. And dog hair, several local hobbyists said, still is a rarity in the knitting world. Renana Lavin, co-owner of We'll Keep You in Stitches on Oak Street, recalls a customer who brought in the shaved coat of her recently deceased collie. With bags of the dog's hair in her clutches, she asked the shop's owners to help her knit something with it. But Lavin said she just couldn't abide, and the woman left the store mumbling angrily under her breath. "In my mind's eye I saw the naked collie," Lavin said. "We were trying not to throw up. We were horrified." Lynette Swanson, owner of Three Bags Full in Northbrook, said she's never knitted with dog hair. "I think of dog hair as something you vacuum up," Swanson said. "I don't think of wearing it." But these days, experts say, knitters are using a variety of textiles, including those made from paper and wire. Stores offer the requisite range of wools, of course, but there's also llama wool, alpaca and rabbit fur. "I'm not fond of that either, but people love it," Lavin said of rabbit fur. "At least it comes already wound, so we don't have to cry and think of Bugs Bunny." At Cherry Tree Hill Yarn in Barton, Vt., an imported yarn made of opossum hair is a big seller. The yarn, from New Zealand, is available in a variety of colors. "It's just a very soft yarn," said store manager Brittany Carpenter. "People really like it." Carpenter may be keen on opossum, but she's not at all into knitting with dog hair. "I have a dog, and I couldn't do it," said Carpenter, who has a West Highland terrier at home. "I just couldn't do it." 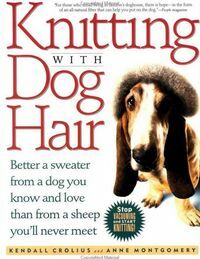 But Kendall Crolius, co-author of the book "Knitting With Dog Hair," says knitting with dog hair should not be pooh-poohed. There are practical benefits in using dog hair — the materials are free, and the dog owner is doing his or her part to recycle. Also, Crolius said, dog hair is exceptionally high quality and is warm. "You're basically getting cashmere for free," said Crolius of Southport, Conn. "What's not to like?" Crolius said the emotional reward is by far the greatest gain from knitting with dog hair. She's gotten many letters over the years from grateful readers. Kirk says she has turned down requests that she expand her repertoire to include cat hair. Her husband and one of her sons are allergic. And for naysayers who question the practicality or cleanliness of knitting with dog hair, Kirk has a quick reply. "If you buy a camel sweater, think of a camel in the zoo," she said as Rex whimpered nearby. "Your cashmere is from a goat. And if you're talking about odors, you don't want a goat in the house." We aren't knitters but our web site will help to create a lot of dog or cat hair a lot quicker. www.furminatoronline shows a quick video of how the product works and the tool is for sale as well as other products that eliminate excessive shedding by gently removing the pet's undercoat. People like having a keepsake of their pets that they can use. I spin dog and cat brushed hair, among other fibers. The finished items are clean and beautiful. I like to spin my angora rabbit's brushed hair so I can have something to remember them. It is comforting and warm. OMG "you know you've gone too far when...."
I wonder if all of the dander goes away with the washing? So you don't wear it and make other people have allergic reactions?